After two hours of gameplay, I'm still coming to grips with all of the controls that I'm working with. I feel like I'm starting to get a handle on it all. I've run a few missions and earned a pretty decent amount and I haven't had to fire a single shot. I know the combat is a big draw for a number of players, but the further I can get without anyone firing a high speed projectile at my very fragile ship, the better. I'm still running around in my starting Sidewinder, though I have already managed to upgrade the power plant and distribution system. From what I understand, maximizing your jump capabilities is pretty vital, especially early on in the game. 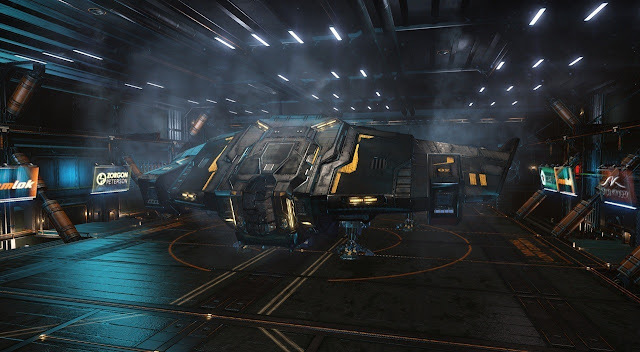 I've also invested in a fuel scoop for those long haul missions without many stations to stop at. I have been really surprised by the breadth of things I can do during any particular session. Anything from hauling cargo to working a smuggling job or covertly taking out some other ship, carries with it a number of smaller considerations before you can undertake them. A cargo mission may not seem to be an issue when investigating it from the board, but once the cargo is loaded, you might find that you can no longer make the jump distance to the next relevant station along the route. Dodging security when carrying illicit cargo could be as simple as flying dangerously fast into the hangar, trying to get to your designated platform before security can scan your manifest. Other things that can happen during flight add depth and stakes to even mundane missions. I had a basic delivery mission that offered over 100k for a short two jump trip. However, once I got distance from the station, I was contacted by the quest giver who moved the delivery to another system that required twelve jumps. I ended up taking advantage of the fuel scoop I had just fitted onto my ship to make sure I had the resources I needed to make the trip. At least once, I got a little too close for too long and overheated my ship, damaging several systems. While I never encountered a hostile ship, I nevertheless was on the edge of my seat for the duration of the trip. Elite Dangerous also benefits from having one of the most cleanly detailed user interface I've seen in a game of its type. I'll admit that there are a lot of little buttons and commands in the numerous screens, but it is laid out in a way that puts function and clarity over style and flare. Until I get my hands on Starfighter Inc. I feel like this is the closest I'll get to playing a game that makes me feel like a part of The Expanse. While I'm starting out in a solo game, I'm really looking forward to getting to know the community of players in Elite Dangerous. 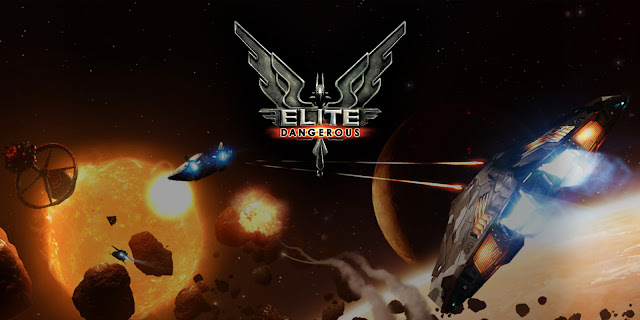 What I read about the recent encounters with aliens on the outer frontiers and some of the emergent gameplay from player groups like the Fuel Rats were big parts of my decision to buy the game. Games as large as this should feel alive, and this kind of activity from players seems to be encouraged by the developers who recently hid a number of messages across the game in a huge puzzle for players to unravel. It all led to the discovery of what appears to be an alien base, which has what looks like another puzzle hidden within it. I may still be a bit rusty, but I am so happy to back in the cockpit of a spacecraft, flying around the galaxy, trying to make a living. I know I've barely made a dent in the content in Elite Dangerous and it will probably be a long time before I really get a handle on all of the game's mechanics but it is a journey that I am very much looking forward to. 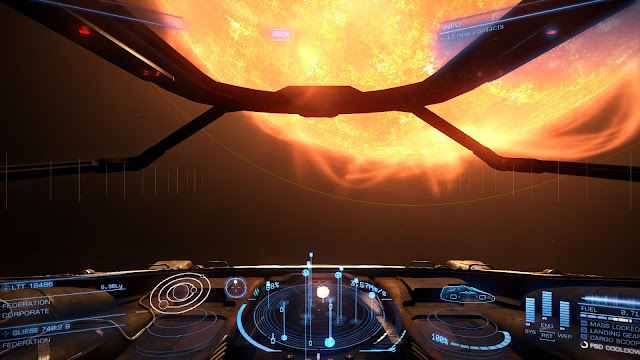 Elite Dangerous is available for PC, Xbox One and now PS4.